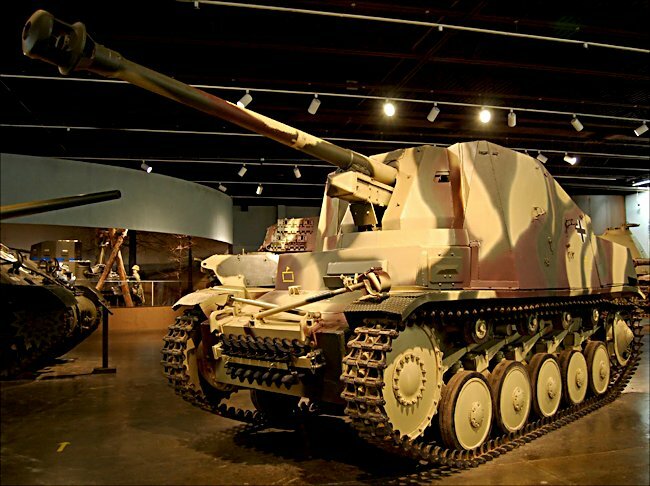 This German Marder II Sd.Kfz 132 Self propelled Gun is in storage at the National Armor and Cavalry Museum, Fort Benning, GA, USA. 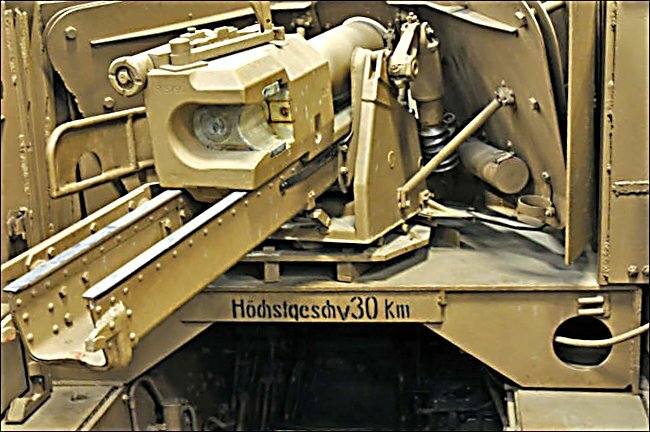 These self-propelled guns were to become the Marder series of armoured vehicles. Some would be tank destroyers fitted with anti-tank guns others would be mobile artillery fitted with howitzers. This was just a stopgap solution until the better tanks and assault guns could be produced. The word 'Marder' means 'Martin' in English. A small weasel like animal with a nasty bite. 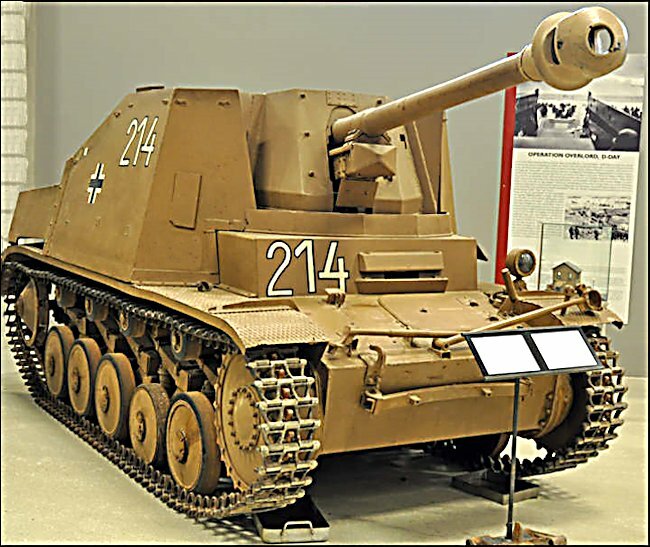 Two versions of the Marder II tank destroyer were produced. 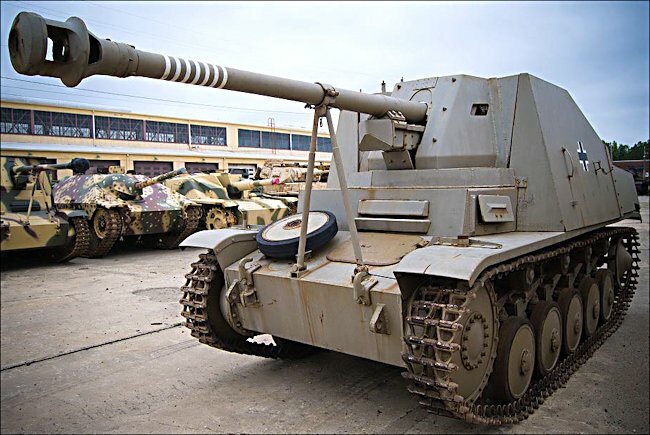 The first production model was fitted with captured Soviet 7.62cm anti-tank guns that had been reach chambered so they could accept and fire the ammunition produced for the German 75mm PaK 40 gun. This improved its penetration capabilities and helped with logistics. The vehicle carried 37 rounds of ammunition.The chassis of the Panzer II Ausf. D/E was used to transport the gun. It was recorded as Sd.Kfz. 132. The gun shield was very thin. The front only had 30mm of armour. Armour on the side vary between only 10mm to 15mm. There was no armour covering on the top of the vehicle or to the rear. It could only just about protect the gun crew from small arms fire. If a high explosive HE enemy shell landed nearby, the hot shrapnel would slice through the metal and into the soldiers. A three-man crew operated Marder II. Early Marder II 75mm Sd.Kfz. 132 Tank Destroyer in factory grey paint with 7 tank kill rings on the gun. The Marder II tank destroyer hand a very high profile. When fighting on the open flat landscape of the Russian front or in the featureless deserts of North Africa, they were very visible. This made them an easy target. They were not designed for fighting inside towns and cities. One grenade thrown into the crew compartment would kill them all. The Marder II crews had to develop tactics that would keep them safe. Their gun had a long effective range. They could stand back, fire at the enemy, and then reposition to a safe location. The crews used any cover they could find that would give them added protection. The second version of the Marder II was the Sd.Kfz. 131 based on the Panzer II Ausf. A to C light tanks, which had been removed from service. Some Ausf. F tank chassis were also used. The crews fighting compartment was widened to take the German 75mm PaK 40 gun. The engineers managed to reduce the height of the vehicle by 40cm. it still had a high profile even so. There was no increased in armour protection for the crew. They were still very vulnerable to indirect artillery fire and direct anti-tank rounds. From early 1942 to early 1943 201 Marder II 7.62cm Sd.Kfz. 132 tank destroyers were built. From June 1942 to early 1944 651 Marder II 75mm Sd.Kfz. 131 tank destroyers were delivered to the battlefields of Europe in North Africa. Where can I find other preserved Marder II SPGs?